Exclusive New Patterns for JazzTurtle Yarns! Last Winter we unveiled the Tailspun Boot Toppers with HUGE success at Vogue Knitting Live. In October I gave a pair to Blues legend, Bonnie Raitt. I think they are going to take over fashion! Then, in the Spring, the Jazzy Scarf came to the line up using a skein of any textured yarn (only 20yds!) and a thin mohair. 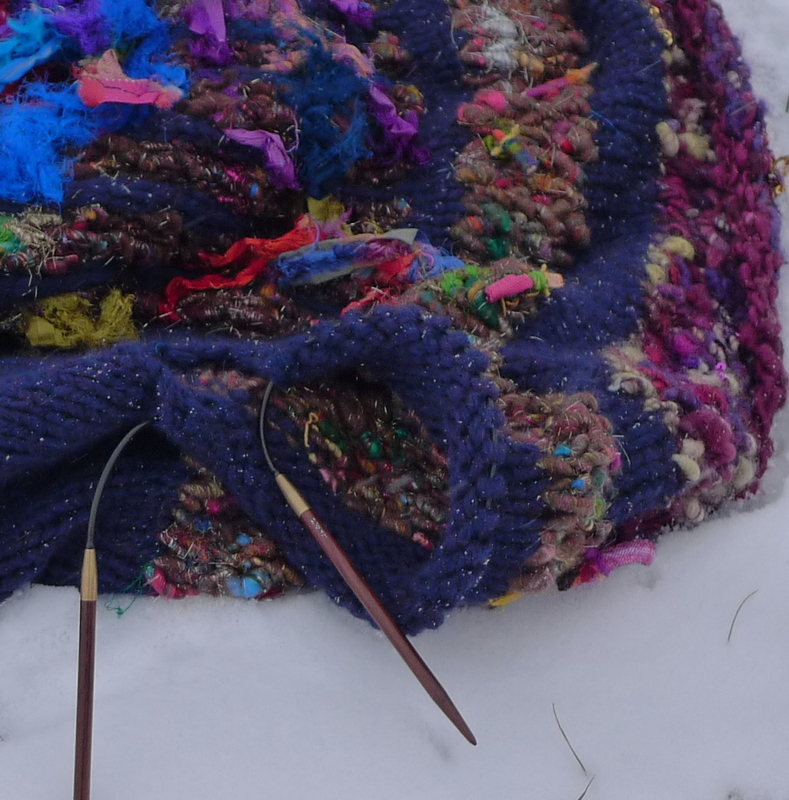 It’s a super cute, quick knit that showcases art yarns perfectly! This season 3 more patterns have been released, and I’m just as excited about them! The first I dreamed up when I was talking with the designer about a project he was working on using a luxury mink yarn by Lotus called, Mimi. It is so very soft and halo’s so slightly with wear. 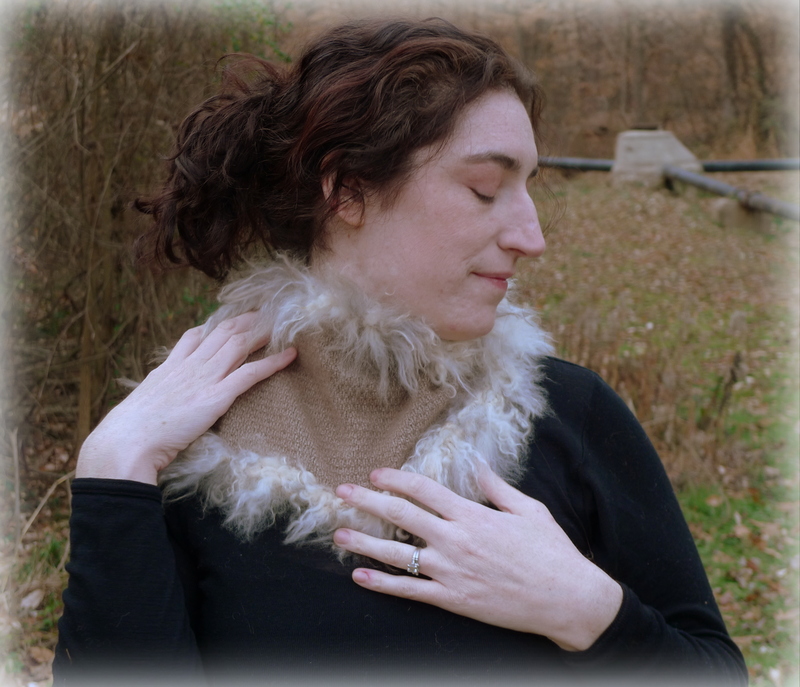 I imagined an elegant cowl trimmed with fuzzy tailspun in cria (baby) alpaca or angora bunny. Something really soft and light and would be just as fuzzy. I sent the tailspun yarn to Vithard and he wrote this this pattern called Rachel. I love the stitch pattern he’s created. It’s soft and drapey and very chic, and the tailspun is so light and fuzzy. It’s just what I had hoped for. I’m totally in love with it and I admit to wearing the sample all the time! 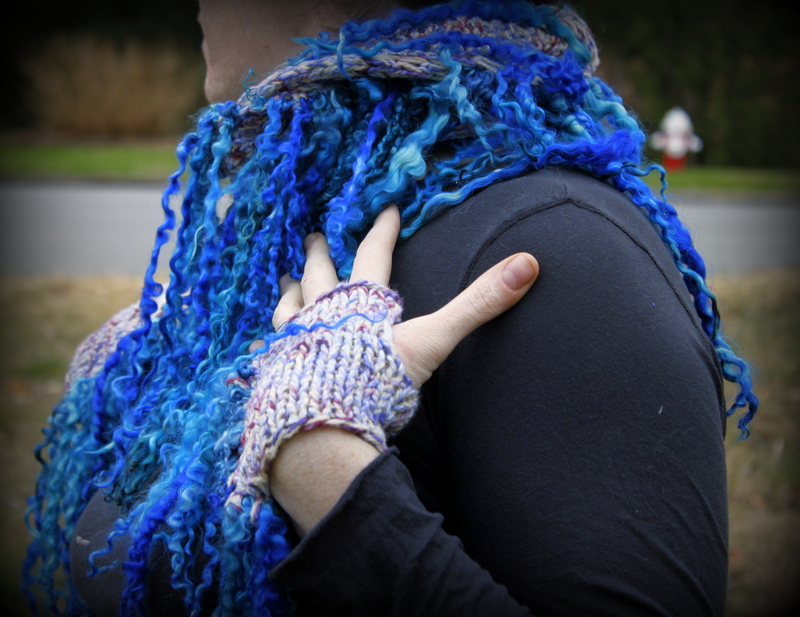 The second pattern is a cute cabled scarf and mitt set using one skein of FringeSpun extreme tailspun yarn! Nancie told me about the idea she had for the set at SAFF and I knew I had to see what she could create. She is a cable master!! This is a long cabled eternity scarf that can be worn long, looped double or even tripled as a cowl. The mitts are so cute! I can’t wait to see this one worked up in lots of different colors! I love how just one skein of tailspun can create such a huge impact! The final pattern from this release is a super funky Spirited sweater using a mixture of textured WildPlied and Tailspun yarns, combined with a mixture of commercial yarns. 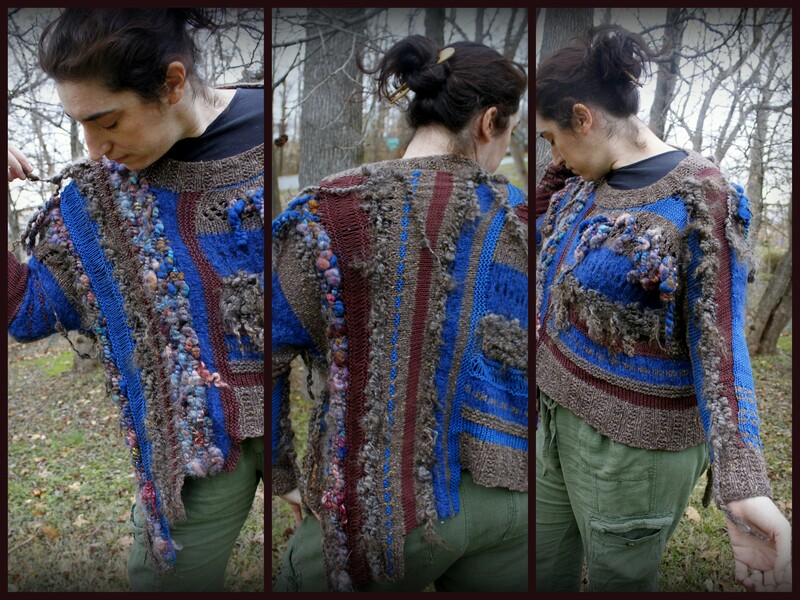 Susan used kid mohair, a mix of tweeds and Berroco for the sample, along with the softest kid mohair tailspun and one of my favorite Raku skeins. This one has infinite possibilites mixing all different colors and textures. I think people can be so expressive- making it as wild or tame a they want it to be. There are lots more patterns coming.. the ideas are flowing and lots of things are in the works. I’m even writing a few myself! I can show you a sneak peek of one new design that’s close to completion.. directly from Vithard’s needles. He took a photo this morning out in the snow. I’ve really enjoyed watching this one come together- He cast on for it while we were in Asheville. This is a very Scandinavian inspired design with some wonderful surprises. It’s knit on large needles and combines bulky commercial yarn with 3 corespun yarns that can have as much texture and flair as the knitter wants to have. Spring festival prep has begun, and is now in full force. One of the major things I’m working on is spinning coordinating yarns that will work together in larger projects like these. I will be updating the online shop until the festival season begins if you’d like to start your projects now. New Cria Alpaca and Angora bunny as well as the Extreme FringeSpun Tailspun will all list in a couple of weeks, and new corespuns will list as well. I’m really excited about the other pattern projects in the works. Sketches are being drawn, designs are being discussed and swatches are being knitted! I can’t wait to reveal the new designs as they come! As always I will keep the Patterns page updated with the new excluisve patterns as well as good general patterns for handspun and textured yarns. If you are a designer that has some ideas on how to feature Jazzturtle yarns in your designs, please email me at jazzturtlecreations@gmail.com with a proposal! I’d love to talk with you! ← Boot Toppers go Celebrity!